The Synod of Constantinople confirms the will to grant it, perhaps in November. The condition: an agreement between the Orthodox traditions present in Ukraine. Kiev Patriarchate of Filaret and the Ukrainian Orthodox autocephalous Church, the "underground" community of Soviet times return to Orthodox communion. The statement of the Patriarchate of Constantinople and the exhortation to "avoid violence and reprisals". Moscow: A "catastrophic" decision. Ukraine therefore remains at the moment without the much desired (and feared) Tomos of autocephaly, as was clarified immediately after the synod meeting one of its most influential members, the Metropolitan of Austria and Hungary Arsenij (Kardamakis). In reality, the document was not even on the agenda. One of the speakers, Daniel of Pamphilon, explained: "Everyone was interested in the Ukrainian question, there were many questions and answers. The report was considered, and there will be further discussions and evaluations", suggesting that the question will be taken up at the next session of the Synod (perhaps next month, in November). New consultations are also planned with the metropolitan of Kiev Onufrij (Berezovsky), head of the pro-Muscovite jurisdiction. In these days, Onufrij was hospitalized due to an illness caused by the stress of the question under discussion in Constantinople. 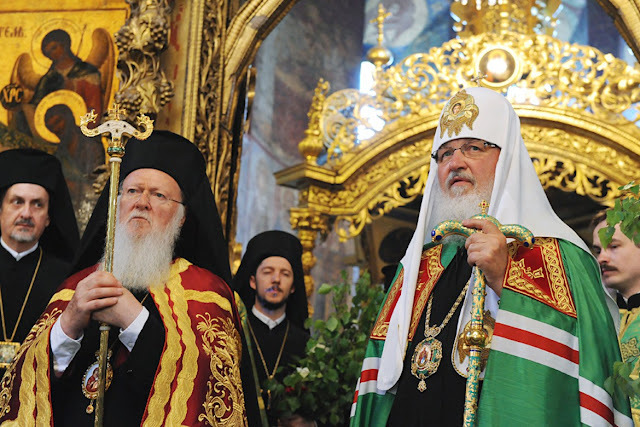 The intentions of the patriarch of Kiev Filaret (Denisenko) will also have to be verified, restored to his original "hierarchical state", which was actually that of metropolitan: the almost 90-year-old hierarch could claim for himself the leadership of the new autocephalous Church. Moreover, there is great expectation for the reactions of Moscow and its patriarch Kirill (Gundjaev), certainly very annoyed by the forgiveness granted to his eternal enemy Filaret, but also relieved given the supplement of synodal evaluation of the matter. Given the interlocutory position of Constantinople, autocephaly is likely to be granted only after a conciliar assembly that brings together all the ramifications of Orthodoxy in Ukraine, if it is possible to convoke it without causing further conflict. Hence the decision to establish a permanent home of the Ecumenical Patriarchate in Kiev, the stavropegion, and the recommendation to "avoid violence and reprisals", as already happened in the remote and near past of the religious life of this "border" country (in Slavic u-kraina). The first reactions from Russian orthodoxy have not been amiable. In a commentary on television, Kirill’s spokesperson Aleksandr Volkov said: "Today the Patriarchate of Constantinople has made catastrophic decisions, first of all for itself and then for the Orthodox world. Constantinople has crossed the red line." Previously, Kirill had threatened the breaking of communion with Constantinople.